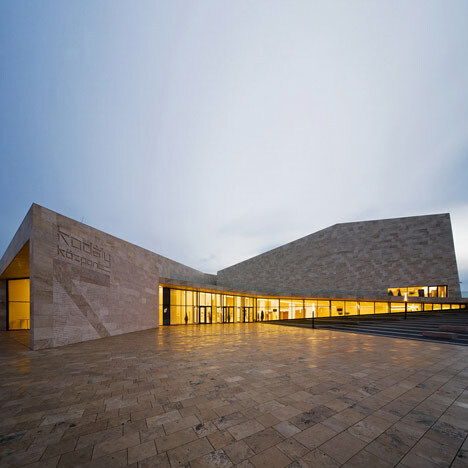 This faceted stone building by Hungarian architects Építész Stúdió contains a concert hall and conference centre in Pécs, Hungary. The Kodály Centre houses the Pannon Philharmonic Orchestra. It was designed in accordance with the mathematical principles of the golden ratio and visitors can walk up a ramped part of the building to a stepped courtyard area. The Hungarian city of Pécs was selected as European Capital of Culture for 2010. The new Kodály Concert- and Conference Centre is one of the main projects for this event. There are two identities constituting the units of our world: inside and outside. Object and space. Extrovert and introvert. Active and passive. Community life and internal silence. The building that we can walk around, and the hall where music surrounds us. The building itself is vivid, moved by the dynamic symmetry of golden ratio. The hall itself is tranquillity filled by the symmetry of intellectual serenity. It all derives from the mathematical basis of our world. “Music that conveys universal truths itself, shows more direct connections with the physical and spiritual world order. There are two sequences appearing significant in the sythesis of our world. As demonstrated below, both begin with the number 1 and 2. In the first sequence, each number is multiplied by 2 to get the next one, while in the second sequence, each remaining number is the sum of the previous two. Both sequences can be found in European music. The first sequence is represented by the symmetry of classical music. It is filled by pursuit of balance. Not like in case of the second sequence. The Fibonacci-sequence is the most common presentation of golden ratio by integers. Golden ratio is usually called dynamic symmetry. Its most beautiful realisation in music is perhaps the 1st movement of Music for Strings, Percussions and Celeste by Bartók. Golden ratio as a characteristic of the living world is perfectly efficient to express fight, struggle and tension of existence, just as balance to express the intellectual serenity. The architectural characteristics of the concert hall are in close harmony with the common principles of design and musical composition. Dynamics and balance. Two sides of the same world. The building elements: stone and wood. Hard and soft. Cold and warm. Age of myriads and centuries. Enduring and intimate. The ancient white stone snail slowly embraces the concert hall lined with pure wood. As if we were listening to music inside a gigantic wooden shape or instrument. The opening of the concert hall means that a 200-years-dream is about to come true in the city’s musical development. Its essential artistic and professional aim, applying the principle of regionalism, is to introduce Pécs as the musical centre of the Southern Cultural Zone. As the residing orchestra, the Pannon Philharmonic Orchestra is going to determine the professional musical concept of the concert hall. The existing traditional concerts gain new dimensions: having the opportunity to invite dominant guest artists who have not visited Pécs before because of infrastructural sanctiness, as well as to perform pieces that could not be staged in the previous venues. These are conditions for further advancement of the orchestra -and now all attainable by the concert hall. The new building include, in addition to a concert hall and a large rehearsal room, the offices of the Pannon Philharmonic and the Conference Centre, other rooms necessary for the operation of the orchestra (such as storerooms for sheet music and instruments), facilities serving the audience -café, bookstore, lounge, etc. - and several service premises. The design competition was closed in the spring of 2007. The winning proposal was submitted by the Építész Stúdió Ltd. from Budapest. The archaeological explorations and licensing procedures were completed, construction work began in July 2009. The opening concert took place in December 2010.
completion date: December of 2010.